Max Caulfield is a most unlikely protagonist. She’s a shy high school senior with a passion for photography who, for all intents and purposes, is your average teenager. Like, your legitimate average teenager; not your average video game teenager. She’s socially awkward and doesn’t have all the right answers, with plenty of rocky relationships to manage. 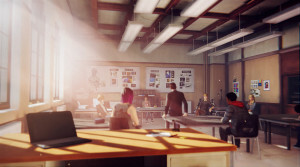 Max is the central focus of Dontnod Entertainment‘s Life is Strange, and she is the central reason you should want to play this game. Gender makes no difference; if you are, or have been a teenager, you will relate to her on some level and very quickly begin to care what’s going on in her life. Going strictly off the first episode, Chrysalis, Life is Strange begins as a slow burn. This is a fresh IP with new characters to establish, and pretty much the entirety of episode 1 is spent getting to know Max and the people in her life, from her ex-BFF-turned-stoner-punk Chloe to the school’s varied faculty. There’s honestly not too much excitement to be seen just yet, but there is enough to keep your interest piqued. By the end of Chrysalis you’ll undoubtedly want to know what happens next. I know I do. Another feature episode 1 takes time to focus on is Max’s all-important deus ex machina ability to rewind brief bits of time. Okay, so she’s not completely your average teenager, but she only learns of this power as you play, and is the epitome of average otherwise. Actually, one complaint to be had is how easily she adjusts to having such a powers. She discovers the ability by a seemingly random happenstance, and takes it with incredible stride considering all the current dramas in her life. She doesn’t freak out; she doesn’t really react at all – she just tests out her new power (which serves as a convenient tutorial) as if adding it to her stockpile of other bizarre abilities. It’s not a major setback, but Max should definitely have had a bit more severe reaction to such a drastic change to her everyday life. That aside, it’s still easy to get into the game if you’re a fan of other point-and-click stories. I said before it’s a slow burn, and that’s not just because of the back-stories and tutorials. You spend more than half the episode just wandering around, examining posters and environments and peoples, and generally getting a feel for everything. While I do hope episode 2 picks up the pace, the slowness of Chrysalis works well to set the stage for upcoming events. Another part of what takes so long is playing with the time hopping mechanic, which is pretty fun. You can only rewind so far, but it’s great for seeing the difference in immediate reactions. Oftentimes Max second-guesses herself no matter what you select, so the choices you make at any given time never feel exactly like the “right” decisions. Already I feel like my choices hold major gravitas, and will have severe consequences later on. This is good, as it pulls the player into the world and keeps them eager for future installments. Moving on, I’m a bit torn on the technical front. The game moves fluidly, and the stylized art is a delight to take in, especially when you’ve got some proper scenery to check out (as opposed to a high school hallway). Life is Strange falters in a specific part of the animations, however; nobody seems to be able to move their mouths in time with the words. It’s not like a bad dubbing of an old Japanese movie; rather, the mouths barely move at all, and the few movements made seem like almost random flapping. This is super unfortunate, considering you spend nearly the entire game talking to people and looking directly at their faces. The models all look great, but I can’t get past the unfortunate mouth animations. The music is top notch though. 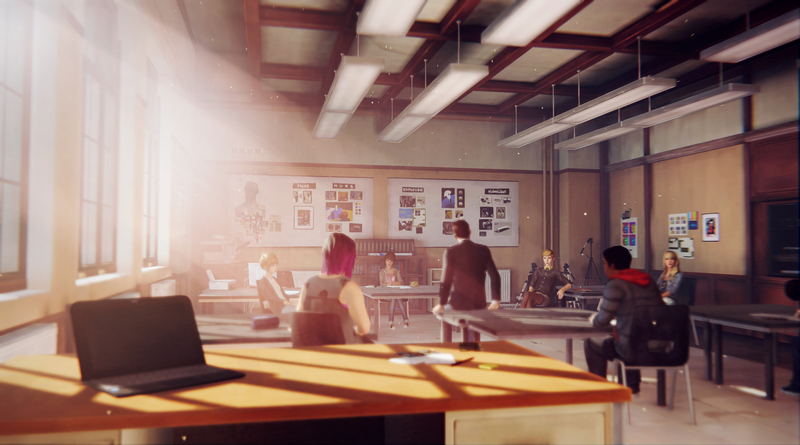 With a soundtrack featuring artists such as Bright Eyes, Amanda Palmer, Syd Matters, and Mogwai, Life is Strange boasts the quintessential soundtrack for an angsty high school student. It’s mellow, it’s mood-setting, it’s relaxing, and it’s wonderful. I loved listening to the tunes in-game, and they actually helped the words flow while writing this review. I may not be the angst-ridden introvert I once was, but this soundtrack is still one of the best parts of the game. Similarly, the vocal talent is fairly strong here. While the mouth movements may be off-putting, the voices behind the characters make it difficult to stay mad. Incidentally, my only uncertainty in the cast lies with Max’s voice. I can’t tell if Hannah Telle is excellent at conveying teenage apathy or just poor at conveying any real emotion. I’ll give her the benefit of the doubt for now and touch on this again in future coverage of the game, as I imagine emotions will run pretty high as the series continues. Bring your A-game, Hannah. Overall, it’s awfully disingenuous to rate a new series based on the first 20% of it. I’m giving Chrysalis a 7/10 because for the minor gripes and complaints, I enjoyed what I played and was left with a good feeling about the future of Life is Strange. That said, I can also easily see the game taking a nosedive without much effort. 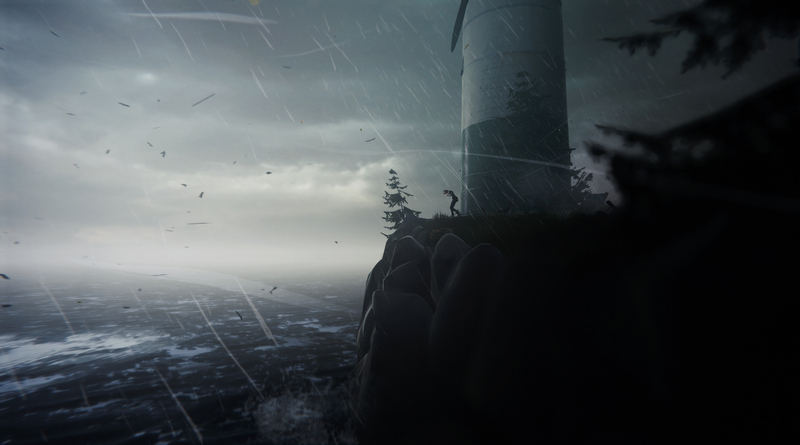 Life is Strange is off to a good start. Please don’t screw it up, Dontnod. Life is Strange is an episodic game currently being developed by Dontnod Entertainment and published by Square Enix. Episode 1, Chrysalis, is currently available on PlayStation 3, PlayStation 4, Xbox 360, Xbox One, and PC. An Xbox One code was provided to Save/Continue by the publisher for review purposes.